As a veteran of Special Forces (and a keen observer of military affairs) I decided with my unique perspective to wade through the 800-plus pages of the Select Committee Report on the Benghazi debacle, which as we all know cost 5 Americans their lives. It is, as you can imagine, a rather daunting task; and far too much material to cover in a single post. So, instead, I will comment on those glaring errors in judgement, actions, and questions remaining as strike me (from a military standpoint) while reading the Report; here in bite-sized parts. It should be keep in mind that the initial attack on September 11, 2012 upon the Ambassador’s residence at the American Diplomatic Mission in Benghazi (not designated as an official “Consulate”) began (approx) at 9:42 local time. It would continue as an off-and-on engagement for the next 13 hours. The fighting would start at the Diplomatic Mission compound where the Ambassador and six other Americans were present; and continue through the dark streets of Benghazi; and, finally, into the early morning hours at the CIA Annex, which came under siege. 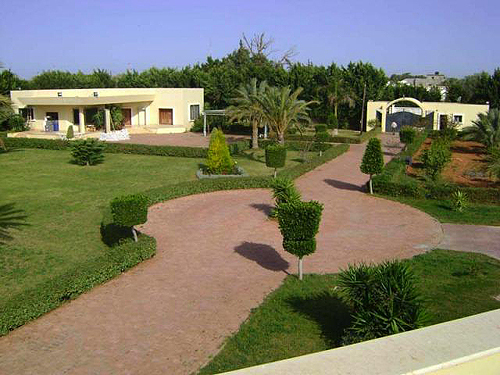 View of the CIA Annex compound in Benghazi; from which the GRS operators launched their rescue attempt of the beleaguered Mission; and which was itself the scene of attack in the early hours of September 12th. Operators fought and died defending from these roofs. During these hours, a senior team chaired (by phone) by Secretary Hillary Clinton debated the ongoing attack and made-up an Action Item List. Missing from this meeting was the Secretary of Defense (or senior deputy), Director of the CIA, or any senior military chief. This meeting will be discussed later. But what was not among the 10 items on their Action Item List was a plan to dispatch an immediate rescue; this at a time when the battle was ongoing and the Ambassador was only reported as missing, not yet dead. GLARING FAILURE 1: Why did the Marine F.A.S.T. platoon not deploy in time to effect outcome of battle of Benghazi? One question that I found myself asking early into the Report was why did the Marine Corps Fleet Anti-terrorism Security Team (F.A.S.T.) take so long to launch from its base in Rota, Spain to Benghazi? What is found in the Report, as testified before the Committee by the F.A.S.T. platoon commander on the ground, is truly astonishing to someone who served for many years in Special Forces (myself). The F.A.S.T. platoon leader in Rota (likely a Marine Corps First Lieutenant or at best a Captain), aware of what was happening at Benghazi through news reports, decided along with his “Gunny” to initiate the “recall order” at 12:45 am (1:45 in Benghazi); and began assembling his platoon in preparation for deployment. At that time, the Ambassador’s residence at the Mission was in flames, and the Ambassador reported as merely missing. The battle had moved to the streets; as the CIA Global Response Staff (GRS) operators, who had gone from the nearby CIA Annex to the Mission to rescue the Ambassador and his Diplomatic Security detail, were retreating to the Annex with the survivors. AT 2:39 the F.A.S.T.team received official orders to deploy to Libya. The team was fully packed-out and waiting on the tarmac of the airfield at 5:45. Though ready to deploy, the F.A.S.T. platoon in Spain had to wait, as its air assets were not at Rota, as one would expect. They were in Germany, at Ramstein Air Force Base! It was not until NOON that the C-130 arrived from Germany; fully 9 HOURS after the orders to deploy! Now, I don’t ever remember being hours away from my airfield when my unit was tasked as a “Rapid Response Force” (or the “Ready”, or “Go” unit). What sense does it make to have a fast response force that is hours away from the air assets required to deploy it?? By the time the F.A.S.T. rescue team actually took off, and landed in Tripoli (not Benghazi), the battle was long over and three more Americans were dead at the Annex. These delays show the utter lack of preparation and coordination at all levels, an operation that was utterly FUBAR from beginning to end. Only the junior officer commanding the F.A.S.T. platoon at Rota and his men showed the proper alacrity and concern for timeliness necessary to accomplish such a rescue mission as was required of them that night. I wrote this in 2012. My point about CBA still stands. Where was Obama? Hiding, to not be pinned down to grant or deny CBA. Telling Panetta “Do everything you can” is not granting CBA, only POTUS can do that. The giveaways in the report are the many references to attempting get “dip clearance” from the Libyan govt. If CBA is granted, that is moot. If CBA was granted, the written and signed order would have been produced. It is easy to grasp the point about the FAST Team deployment transport being countries away but I must ask a key question where was the CIF”? I oringally read a couple of reports about an Army SF LTC attempting to get the CIF in the fight. I am very familiar with the mission set of the CIF, very aware of the CIF deployment timelines, and am a retired Special Forces officer myself. So, Colonel, in your opinion could help have arrived in time to save at least some of these men? No one will ever know the answer to that question. However, POTUS should have granted the authority to the RCC to launch the CIF. The CIF would have conducted enroute planning, coordinated the required joint assets for support, and conduct the mission. Yes I believe there was time to save many if not all. When Americans are at the Alamo, I doubt any of the CIF would have just twiddled their thumbs. There was a lot of thumb twiddling at the White House. These men were sacrificed for the election. Anyone that does not belive that is a fool.